Dr T R Nanda Kumar graduated from University of Mysore in the year 1997. He subsequently completed his MD in General Medicine from the Rajiv Gandhi University of Health Sciences in the year 2001.Trained in the UK, both in Colchester University and Princess Alexandra Hospital, Harlow. Underwent Cardiology training from Vijaya Hospital, Chennai from the year 2006 and obtained Diplomate in National Board, New Delhi. Underwent training in Interventional Cardiology at Birmingham Heartlands Hospital, Heart of England NHS trust, Birmingham, UK till July 2013. He is a member of the European Association for Cardiovascular Prevention and Rehabilitation.Very recently, he has been inducted as a fellow of European Society of Cardiology. 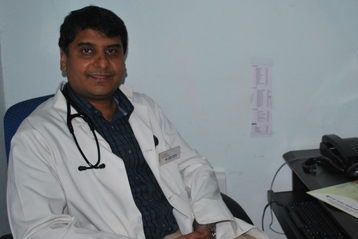 Currently, he is working as a Consultant and Interventional Cardiologist in Sri Ramakrishna Hospital, Coimbatore. His special interest include coronary interventions, preventive cardiology and treatment of hypertension and lipid disorders. Outside academics he is interested in sports related activities and likes to spend time with family and friends.